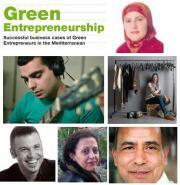 Green entrepreneurship provides opportunities to tackle environmental and social challenges and to promote sustainable lifestyles in the Mediterranean region. The green entrepreneur integrates environmental, economic and social axis in core business; provides innovative solutions to the way goods and services are produced & consumed; and the scaling-up of his / her business model contributes to greening the economy. In order to foster green entrepreneurship in the Mediterranean, the Regional Activity Centre for Sustainable Consumption and Production (SCP/RAC) has collected business cases of green entrepreneurs from different sectors of the region that you can view and download here.